Dr. Ernesto J. del Rosario is recognized for his outstanding research contributions in physical chemistry and industrial biotechnology. 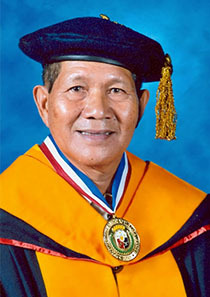 Dr. del Rosario, the country’s leading expert in biofuels, is known for his pioneering R& D work on novel and practical ethanol fermentation processes using various substrates which include saccharine substrates, novel starch substrates such as cassava, unripe or reject bananas and lignocellulosic agricultural wastes. He designed and optimized pretreatment and saccharification processes for these lignocellulosic materials which are difficult to ferment.